When looking for a budget-minded seating option for my home recently I decided that sometimes you just have to do it yourself. 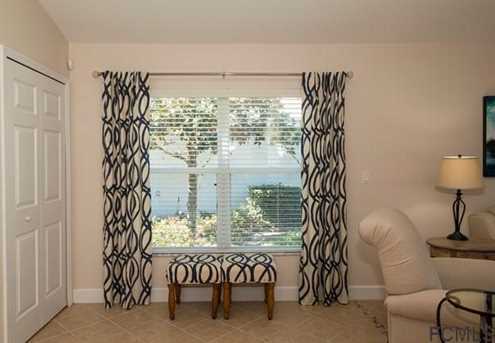 I was frustrated by unsuccessful attempts to coordinate window treatments with extra seating for the kitchen area in our Florida house. First, I fell in love with window panels from West Elm. The style, design, and color were a perfect complement to the decor in my space. This post contains affiliate links for your shopping convenience. When you use one of these links I receive a small compensation that helps support the costs to publish this blog. 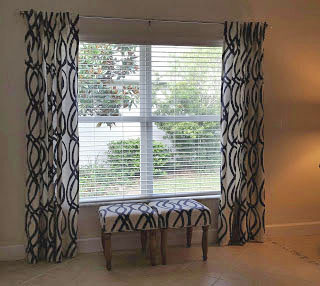 Once the curtain decision was made I went on the hunt for a bench solution that would fit under the window. I wanted something that could easily be moved. The house is small and the main living space needs flexibility to easily accommodate family and friends. Ideally, I wanted two small stools that could be moved around whenever needed for extra seating. 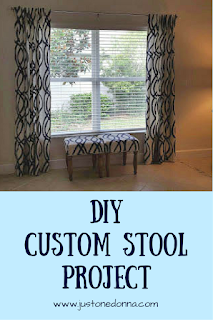 I also wanted my stools to be inexpensive, or better yet, cheap! So the search began. I looked online. I looked in retail stores. I looked in consignment shops and second-hand stores. I looked and looked until one day when in Target I spotted two stools. They were simple, upholstered stools covered in a gray floral fabric. They were right height and size to fit in my space and perfect, except for the fabric. The clearance price of $17.00 for each made me stop and think. I hemmed and hawed. Could I slipcover them? Did I have the nerve to attempt to recover them? After all, I have never attempted upholstery projects before. In the end, the price and my can-do spirit won me over and convinced me it was worth a try to recover them. I apologize that there are no before pictures. 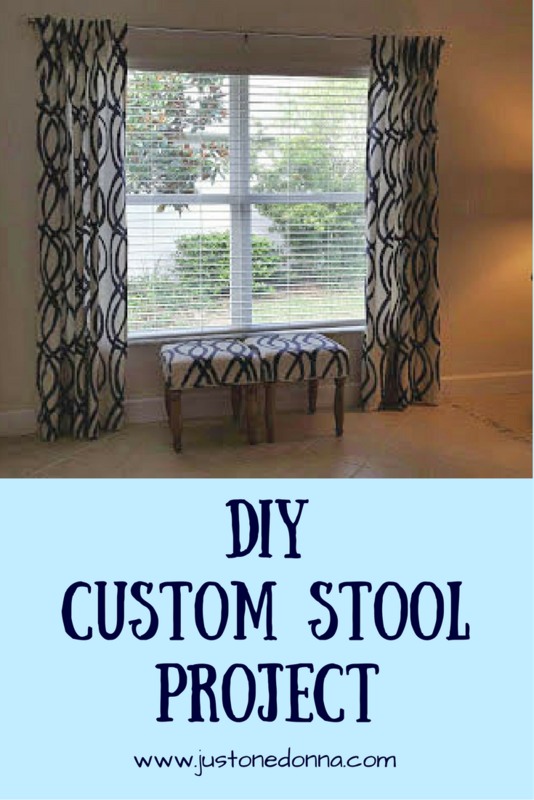 This post is not a tutorial on recovering stools. It really is a simple project. You can find a number of YouTube videos that will help you get the job done. This post is about what I learned in the process of recovering my stools. I hope what I learned will help you when you attempt a project like this. You need the right tools. I was gung ho to get this project underway. I had my fabric. I had my stools. This was going to be easy. Hmm, two years later I actually finished this project, but I initially thought it would take me a couple of hours. I started by removing the original fabric from one of the stools. The only tool I had was a screwdriver to pry off the staples securing the covering. It took me hours and hours. 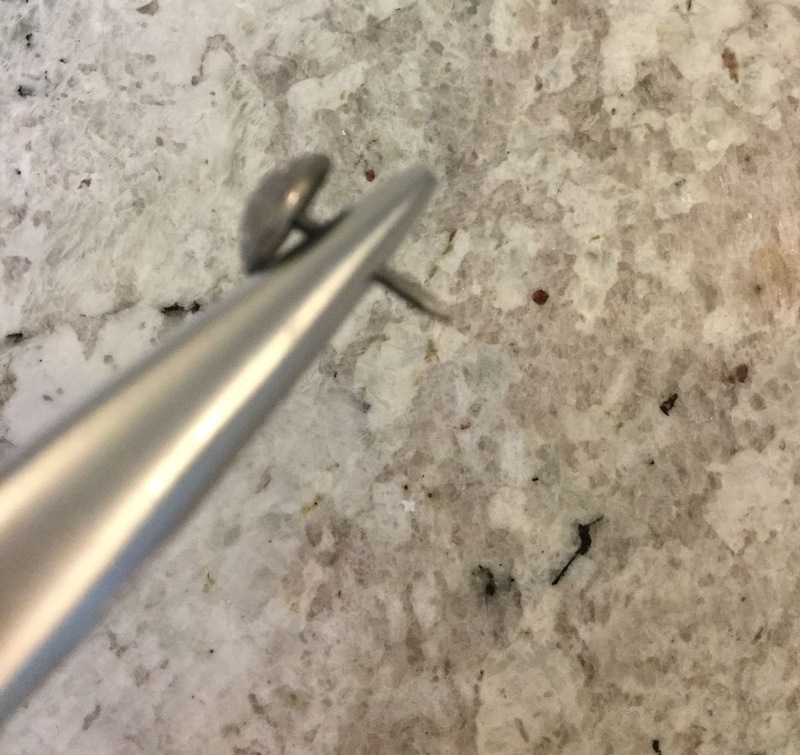 It is a miracle I didn't end up in the emergency room as the screwdriver slipped and I nearly stabbed myself, not once or twice, but many times. I was so disgusted by the time I got the fabric off of one stool that I put both of them in a corner and walked away. Don't start until you have the right tools. Ignoring an unfinished project doesn't get the project done. Every time I looked at those stools tucked away in a corner they reminded me I had given up. I began to rationalize, telling myself it was okay not to use those stools. Perhaps I should just spend $250 on a plain navy blue bench I saw online. Maybe I could take the stools to the local upholstery shop and have them finish the job. Yes, those were both practical solutions, but deep down I wasn't ready to let this simple project get the best of me. As time went on, those stools started to haunt me. Something had to be done. The two years this project took to complete was due to 729 days avoiding the project. Rely on the experience of others. One way to learn a new skill today is online through blogs and YouTube videos. The tutorials I found online were very helpful and gave me the courage to start the project, but they didn't share the pitfalls. Those little pitfalls are what can make or break a project. The turning point for me was a conversation I had with a neighbor who had just recovered some chairs in her dining room. Not only did she have some helpful tips, but she had the right tools and she was willing to lend them to me. Keep it simple. To keep my project simple I took the stools apart carefully so I would be able to follow the original covering approach. That meant I had a custom pattern already prepared for me by using the fabric on the stool for that purpose. I also decided not to tuft the top of the stools. I didn't have the right tools for that and I thought a smooth seat would have a more modern style. I also reused as much of the original materials as I could. I used the original cording to make custom piping for the recovered stools. I reused the black fabric finishing piece for the underside of the stool that would cover all the staples. I would have reused the decorative studs along the edge of the stool, but too many were too bent by the original application process for reuse. Little things make a difference. It's the little things that will sabotage your project. For example, There is a big difference between a screwdriver and a tack lifter. Once I had a tack lifter the task of removing both the staples and decorative studs was quick and easy. Using a simple pattern can make your life easier. For example, I needed something to help me space out the decorative tacks. 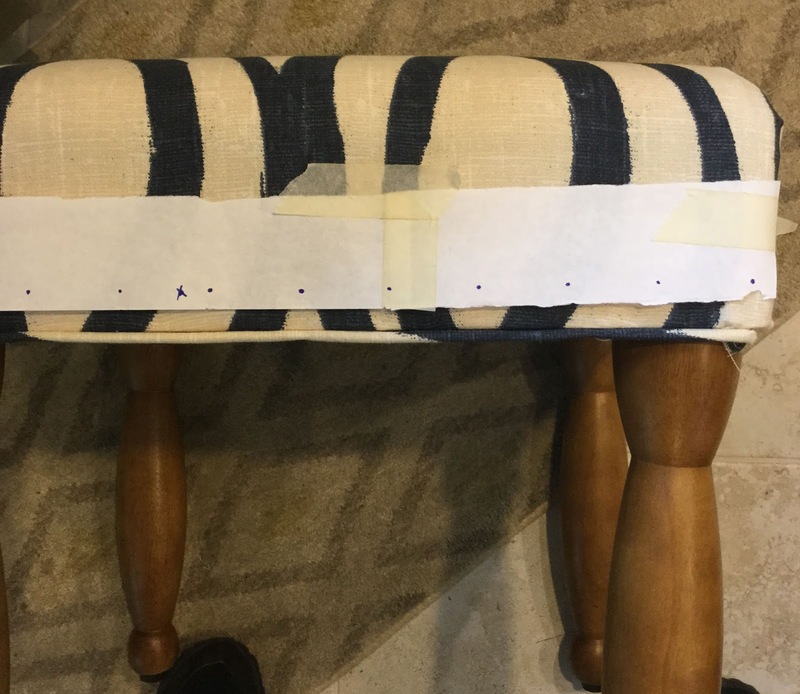 For that, I measured out the desired spacing on a strip of paper and reused it as a guide on each side of the stools. One tip I picked up from reading customer reviews when purchasing the decorative tacks for this project. It was simply to use needle nosed pliers to hold the tacks when hammering them into the stool. And finally, be sure you have a good stapler. I used a staple gun attached to an air compressor that made the stapling part of this project a breeze. I learned a lot from this project about recovering furniture and about myself. The actual time it took to complete these stools was about eight hours. That includes the frustrating time I spent with the screwdriver removing staples on the first stool. Learn from my lessons and you can probably do it in half the time.